The gateway to Fiordland and the main town in the area, Te Anau sits on the shores of the lake of the same name. The largest lake in the South Island, Lake Te Anau is a destination in its own right. Te Anau (pronounced Tee An – ow) means “the swirling cave” and is likely named after the underwater glowworm caves which formed part of Maori legend and were rediscovered in 1948. A bustling little town with a good number of shops, restaurants and tourist amenities, Te Anau is a great place to base yourself for your Fiordland adventure. Summer can be very busy and it is worth booking early with us for this time of year. 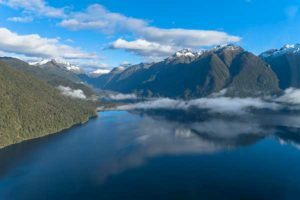 A wonderful boutique cinema showing the latest releases and exclusive showings of “Ata Whenua – Shadowlands”, which takes you on an evocative and unforgettable journey through Fiordland. Situated next to Fiordland Cinema in the heart of Te Anau, this locals’ favourite serves a hand-picked selection of New Zealand’s fine wines as well as a fantastic line-up of whiskeys and all your favourite drops. Gourmet tapas and platters can also be enjoyed and can be combined with a movie at the cinema. If you are looking for Te Anau accommodation with a difference, you will find it at The Cinema Suites. Hidden away in the heart of Te Anau, experience a romantic, luxurious getaway with stylish design, bespoke interiors and a spectacular forest wall panorama.